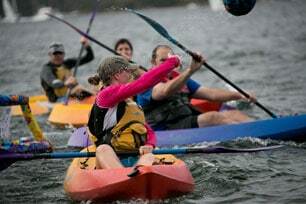 Usually, when people think about kayaking they think of extreme sports, adrenaline junkies and almost unearthly rapids that seem to swallow people whole. What people don’t realize are the added health benefits of kayaking. Kayaking doesn’t have a high learning curve as most people think. It is easy to get into, and you can take your time perfecting your basic skills while learning new ones for years to come. You can’t get bored from kayaking, as it has so many different types and uses that almost everyone will find something that fits them. It can be done with friends and is a very fun social activity; you can make a whole day out of it, or, just go at it alone. Either way, it is enjoyable. If you are rowing at about 5mph then you are exerting about .1 hp of effort, which comes around to about 400 calories per hour, the more you row, the more calories you burn, which is a dream come true for any weight watcher. The whole process is very therapeutic from the start to the very end. You don’t have to go to any fast-flowing rivers and can just as easily take your time to go kayaking in lakes or parks and enjoy the calm water, watch how your kayak moves through the water with barely any resistance. It gets very philosophical, so I am just going to stop here. Paddling isn’t an easy thing to do. You use most of your muscles starting from the back, to your arms, chest, and stomach. Each of these areas is used in the process, and when you are going at about three mph, you will be doing about 1500 repetitions from most of your upper body and some muscles from your lower body as well. This will keep you in tip top shape and look good! There are a lot of kayaks brands out there, and most of them try to focus on one specific type of kayak, so you have to know what you are looking for. If you are looking for a good fishing kayak, then Sea-eagle is a pretty good choice. It is cheap and does the job well. And if you are looking for something for beginners then the Eddyline Equinox or the Wilderness Systems Tsunami is a pretty decent choice. Or if you need something for recreational purposes and something you can just relax in, then Sun Dolphin Aruba or Ocean Kayak Scrambler are both pretty nice and within budget. The best kayak for fitness is probably either the Necky Chatham 18 which is for extended sessions or the Riot Kayaks Edge. Both of them are made for longer periods and are more suitable for some experienced kayakers. Once you get started there will be a lot less you won’t be able to do. The mindset changes completely once you are out on the open water. Rowing fitness is just a single part of it.